Team Saskatchewan going to the 2019 Senior National Championships will participate in a training camp leading up to the competition. This training camp is only for athletes who will be competing at the 2019 Senior National Championships and location of the training camp will be determined after the team has been selected. 2019 Canadian Senior Weightlifting Championships will take place in La Prairie, Quebec at High School De La Magdeleine on May 18-19, 2019. Senior athletes must achieve a total in a competition sanctioned by the SWA in which he or she is a member in good standing or at a higher caliber competition. This total must be achieved from October 6, 2018 to March 31, 2019 inclusive. 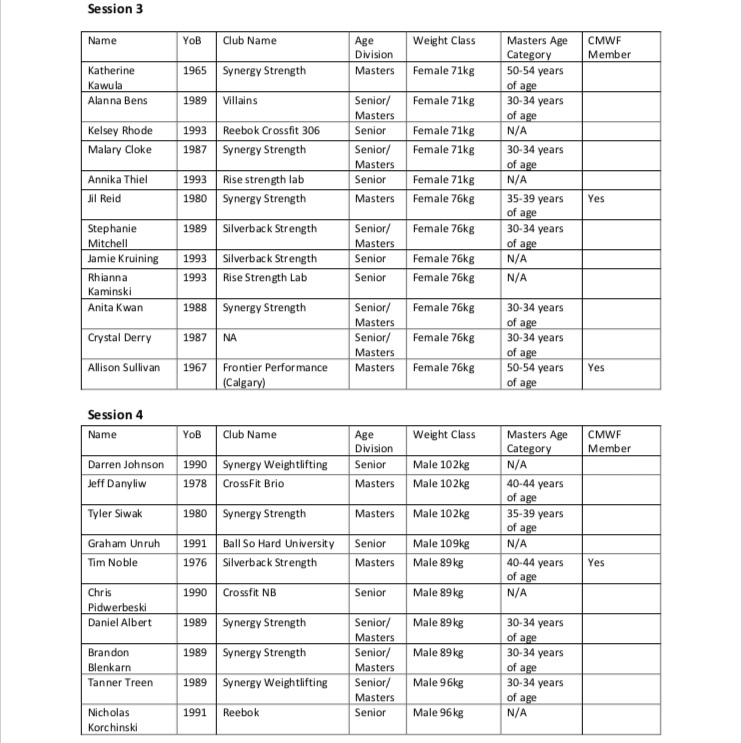 There are qualifying totals for each weight class athletes need to achieve. Pure Athletics will be hosting the annual PA Open. This competition is always a fun meet and brings a good crowd to end the season! This is the first step to being certified to be able to coach athletes at SWA-sanctioned events. In this course, you will learn the fundamentals of TEACHING weightlifting technique to athletes of different levels. It will prepare you to coach an athlete through a competition and go through the logistics of a sanctioned weightlifting event. The 2019 Western Canadian Championships will be taking place in Lake Country, British Columbia. Team size will be determined once the rules and regulations document has been received by the organizing committee. The Saskatchewan team will be picked based on provincial ranking by Robi points. After the Reebok CrossFit 306 Open/Senior Provincials, the team will be selected and athletes will be notified by February 17, 2018. They will have to register and pay fees of $250 by February 24, 2018. Team Saskatchewan going to the 2019 Western Championships will participate in a training camp leading up to the competition. This training camp is only for athletes who will be competing at the 2019 Westerns Championships and location of the training camp will be determined after the team has been selected. The Reebok CrossFit 306 Open will also be the Senior and Masters Provincial Championships. 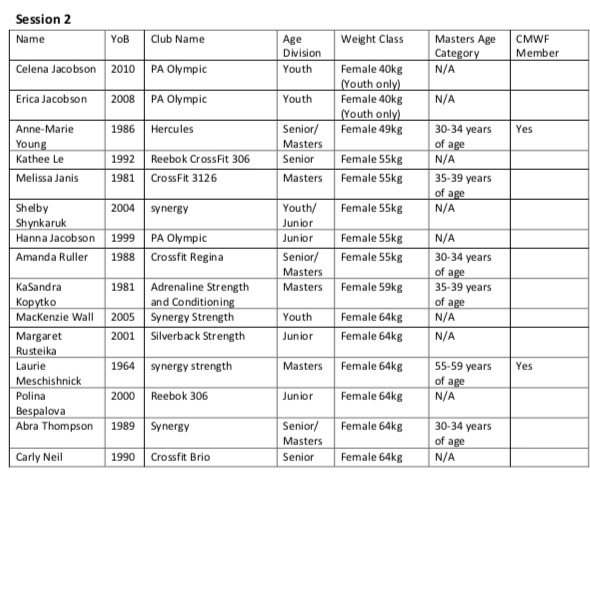 Masters athletes must compete at a Provincial Masters Competition to qualify a total for the 2019-2021 international masters events including the 2019 World Masters Weightlifting Championships in Montreal taking place August 16-24, 2019. This competition is subject to doping control. SaskSport is hosting a session on mental health; an important topic in today’s sport world. Stress, pressure and performance standards affect not only athletes but coaches as well, and can put strain on one’s mental health and wellness levels. Register here. 2019 Canadian Junior Weightlifting Championships will take place in Brossard, Quebec at Antoine-Brossard High School on Saturday, January 19, 2019. Junior athletes must achieve a total in a competition sanctioned by the SWA in which he or she is a member in good standing or at a higher caliber competition. This total must be achieved from July 1, 2018 to December 8, 2018 inclusive. There are Minimal Thresholds of Performance for each weight class athletes need to achieve. The Saskatchewan team will be selected after the Voodoo Weightlifting Open. Team Saskatchewan going to the 2019 Junior National Championships will participate in a training camp leading up to the competition. This training camp is only for athletes who will be competing at the 2019 Junior National Championships and location of the training camp will be determined after the team has been selected. CrossFit Regina will host the Titan Open. This one-day competition will be the only competition of the season hosted in Regina so we hope to see many athletes from Southern Saskatchewan compete, along with athletes from Northern Saskatchewan. The AGM is open to all members and is an opportunity to hear from the board of directors on the past years happenings and to get an update on the direction of the association. If you have questions or concerns this is the best time to voice them and we look forward to hearing from our membership. The Voodoo Weightlifting Open will be a two-day competition* held at Synergy Strength and also will be the SWA Junior Provincial Championships. Saturday will be the Junior Provincial Championships and Sunday will be for Senior and Masters Open competition.